The analysts of a fresh business and commerce study by Transparency Market Research have detected a fragmented competitive landscape in the global smart grid security market, attributing the scenario to the presence of a large number of players who are catering to regional and domestic demands. Regional players have a stronger presence in the developed countries across the world. That being said, a few international players do hold a position of strength over some of the domestic players, such as Siemens AG, Intel Corporation, Symantec Corporation, Cisco Systems, Inc, IBM Corporation, Leidos Holdings, Inc., BAE Systems Plc., Honeywell International Inc., N-Dimension Solutions Inc., and AlertEnterprise Inc. For most of key players, the primary strategy is to provide customized IT security services to their customers in a bid to stay ahead of the curve. As per the evaluations of the TMR report, the worldwide smart grid security market will be worth US$10.58 bn by the end of 2025, substantially more than its calculated revenue-potential of US$4.35 bn in 2016, exhibiting an impressive CAGR of 10.5% during the forecast period of 2017 to 2025. In the near future, the analysts anticipate the scenario of distributed shares to sustain as well as foresee a significant increment in partnership and collaboration activities, which not only helps them add to their product portfolio and expand their geographical presence. Another area of concentration for the market players is how to logically leverage the growing field of cloud and the internet of things (IoT), as these advancements have significantly increased the vulnerability of cyber security. On the basis of deployment, the TMR report segments the smart grid security market into on-premise and cloud, whereas on the basis of security type, the market has been bifurcated into network security, database security, endpoint security, and application security. Application-wise, the report has gauged the potential of demand coming from smart meters, renewable energy resources, smart application, and energy efficient resources. 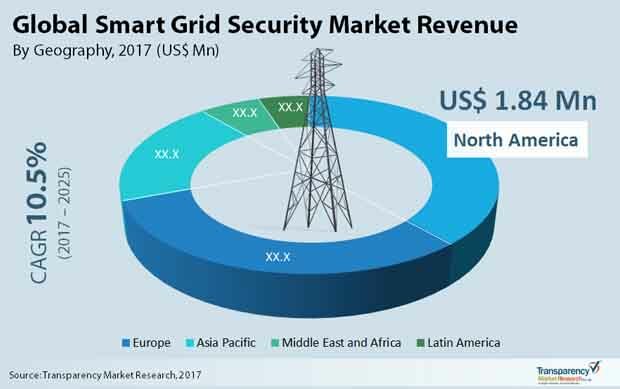 Geographically, the TMR analysts have picked out North America are the region that currently provides for the maximum demand, accounting for 38.7% of the global demand for smart grid security in 2016. However, the demand from the region of Asia Pacific, driven by the emerging economies of China, India, Japan, and South Korea, is projected to expand at an above-average CAGR of 11.3% during the forecast period of 2017 to 2025. Relentless escalation in the need for energy and recent advancements in the technology of power grids are two of the primary drivers of the global smart grid security market. Across the world, governments of a number of developed and developing economies are urging grid operators to utilize the latest technologies in order to meet the increasing demand as a result of urbanization and consequently the consumption of electricity. Smart grids are essentially a combination of IT with traditional grid and thereby offers stronger control over the functions in order to improve reliability. In the recent past, cloud-based smart grid applications have gained adoptability as they significantly curtail the operational costs by centralizing their resources. Increased sophistication of cyber-attacks and government regulations to maintain efficient means of energy consumption are another two drivers of the global smart grid security market, which on the other hand is restrained by factors such as lack of awareness among a number of stakeholders and the need for periodic maintenance. Nevertheless, the continuous evolution of smart grids and integrated offerings of smart grid IT and cyber-security solutions are expected to open new revenue avenues for the vendors of this market.